Description: Central neighborhood house absolutely loaded with character. 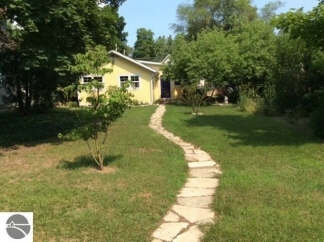 House is set back from the street with a large fenced private yard boasting an oasis of beautiful trees, shrubs, flowers, ground cover & raised garden beds. New addition nearly doubled the house’s size. New roof & siding blends the old part of the home with the new. Skylights, sliding doors, bead board ceiling. Most of the mechanicals, all doors and windows are new. Enchanting stone patio and walkway.